In the wake of the 2008 Lehman Brothers bankruptcy, global capital markets were chaotic at best and totally illiquid at worst. Banks stopped lending and ran for cover, exacerbating the downward spiral and leaving businesses across the country starved for capital. Amid this disarray, creative U.S. companies turned to the long-underutilized EB-5 Immigrant Investor Program, often partnering with established Chinese migration agencies to identify thousands of overseas investors and pool their capital. The result: scores of worthy U.S. projects – otherwise impossible to finance – were jumpstarted, creating thousands of much-needed jobs and making a concrete contribution to America’s economic recovery. By voting with their capital, EB-5 investors around the world – with China leading the way – proved that the U.S. economy remained worthy of their long-term trust and confidence, despite the depth of the recession. For U.S. companies, EB-5 morphed in a few short years from an afterthought to a dependable source of flexible investment capital. From 2011 to 2014, EB-5 capital flows from China grew 82.84% and exceeded $5.55 billion, accounting for 82.95% of all EB-5 investment, according to a report from the nonprofit trade association Invest in the USA (IIUSA). The two firms we lead – Chinese migration consultancy Well Trend United and U.S. EB-5 investment manager Civitas Capital Group – serve thousands of families and individual clients who have invested in over 120 job-creating projects across the United States. In the aggregate, we have capitalized investments that have created literally thousands of American jobs, all at no cost to the taxpayer. In short, we and many others have experienced firsthand the power of EB-5 to drive economic activity and create American jobs across a range of industries. But for all its successes, the program has its critics in Washington, some of whom raise valid concerns which must be addressed. In doing so, it is critical that reform legislation be thoughtful and balanced, so it both addresses regulatory weaknesses and maintains EB-5’s position as the preferred choice for global investors. Five years ago, U.S. Citizenship and Immigration Services (USCIS), the arm of the Department of Homeland Security charged with administering the EB-5 program, took a few months to adjudicate an investor’s application. But USCIS has been unable able to keep up with the program’s popularity. Now, with over 20,000 EB-5 investors in line, the agency routinely takes 15 or even 20 months to adjudicate an investor’s initial petition. At the same time, the demand for EB-5 visas recently outstripped the annual available supply for the first time, leading to an unprecedented backlog of USCIS-approved investors awaiting an available visa. Unreasonably long initial processing times are bad enough in themselves, but the visa backlog also has a ripple effect, delaying subsequent steps each investor must take and thereby extending the entire process for years – an unsustainable, confidence-sapping trend. From the Chinese perspective, it is difficult to understand why the U.S. government would permit such an inefficient system to continue, especially since global competition for immigrant investor capital is more intense than ever. If Chinese investors cannot reasonably expect to complete the EB-5 immigration process within a few years (at most), they cannot make plans for their lives, their families, their careers. And they can and will invest in other countries that are perceived to be more welcoming. In Washington, many have noted that the existing minimum EB-5 investment of $500,000 was set in 1990 and has never increased. There is broad consensus that an increase is overdue. The question is: to what level? The leading EB-5 industry trade association, Invest in the USA (IIUSA), recently recommended increasing the minimum investment amounts to $600,000 for Targeted Employment Area (TEA) locations and $700,000 everywhere else, as part of a broader proposal to restrict TEA designation to truly distressed areas only, such that the vast majority of projects locations would not qualify for TEA status and would thus require investment at the higher $700,000 level. This represents a 40% price increase – a significant price increase by any measure. Some will object that this proposal does not index the existing $500,000 minimum to inflation. Others will note that some other countries require a higher investment. These are both fair points, but they should not be evaluated in a vacuum. Rather, it is critical that in comparing EB-5 to competitive programs from other countries, Congress take into account not just the required investment amount, but also two other key factors: time and risk. Canada, for example, built much of modern Vancouver with Chinese capital that fled Hong Kong ahead of Britain’s 1997 handover of the territory to Chinese control. Since then, Canada’s investment immigration programs have been popular in China. However, Canada suspended its most popular program in 2014 due to, among other things, skyrocketing demand that was overwhelming their ability to process applicants, resulting in a six-year backlog of 65,000 applicants. Sound familiar? In addition, the Canadian program was criticized for failing to catalyze much economic activity. This criticism was well-founded; in stark contrast to EB-5, which has attracted more than $13 billion to U.S. companies in a range of industries and requires each investor to prove the creation of 10 American jobs within two years of receiving residency status, Canada historically required that investors simply invest CAN$800,000 (about USD$717,000) in government bonds. From an American policymaker’s perspective, the EB-5 program’s job creation requirement results in a far superior policy outcome – every investor must help capitalize a real American business that creates jobs for U.S. workers, not just buy a T-bill. From the investor’s perspective, however, the job creation requirements translate into a dramatically higher cost of participating in EB-5 in terms of both time and risk, compared with the Canadian program. Canada considered a six-year backlog unacceptable, but applicants at least knew that if they qualified, they qualified. 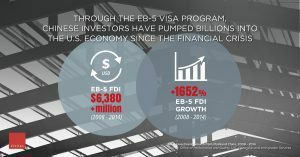 In contrast, Chinese investors can today expect the EB-5 process to take eight years or even longer, and even after enduring the multi-year, opaque, bureaucratic application process, each EB-5 investor must literally risk losing residency status if the required jobs are not created within a specified window of time. Consider: Would you subject yourself and your family to eight years of uncertainty about the security of your new life, your children’s educational plans, your career goals? That is a very high bar – one unmatched by Canada or any other country. The U.K. offers another useful example. Compared to EB-5, the U.K.’s two available programs – the Tier 1 (Entrepreneur) and Tier 1 (Investor) visas – are streamlined and easy to understand, with dramatically less risk. The Tier 1 (Entrepreneur) visa program requires an investment of only £200,000, or about $300,000 – 40% less than the $500,000 currently required by EB-5 rules, and less than half of the $700,000 proposed by IIUSA. In this program, investors can invest in virtually any business, including their own if they will be self-employed, and must create only two jobs. The other U.K. option, the Tier 1 (Investor) program, requires a higher investment of £2,000,000 (about $2,900,000). Some have pointed to this higher required investment as evidence that the U.S. EB-5 program is underpriced. However, the comparison is inapt because the U.K. program virtually eliminates financial risk altogether by permitting the foreign investor’s funds to simply be deposited in a regulated U.K. financial institution and invested in liquid securities, including U.K. government bonds. 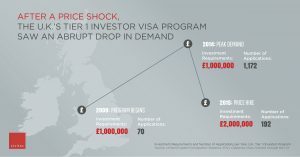 And in contrast to EB-5 and the U.K.’s own Tier 1 (Entrepreneur) visa program, the Tier 1 (Investor) visa program has no job creation requirement at all. Thus, because this U.K. program involves dramatically less financial risk than any EB-5 investment and no job creation risk at all, a higher price point is more appropriate. Even more instructive is the U.K.’s actual experience with its recent price hike for its Tier 1 (Investor) program, which doubled the minimum investment requirement from £1,000,000 to £2,000,000. Prior to the increase, the Tier 1 (Investor) program was increasingly attractive to global investors, with annual applications growing from 70 at the program’s inception in 2008 to 1,172 in 2014. But after the price increase in late 2014, applications dropped by 83% in 2015, to just 192. This trend continued in the first quarter of 2016, with applications falling to 42 for the quarter, a further drop of 26% compared to the first quarter of 2015. It is difficult to overstate the importance of avoiding an EB-5 pricing shock that could lead to a similarly abrupt drop in demand, which benefits no one. And then there is the stark difference in time and certainty between EB-5 and the U.K. programs. While the EB-5 process requires several years to complete, an investor can obtain this a U.K. visa under either program (which leads to permanent U.K. residency after 5 years) within 8 weeks. Like Canada, the U.K. program leaves much to be desired from a policy perspective. But the risk-reward profile for the potential investor – that is, the competitive threat to the United States – is very compelling. The U.S. is alone in the world in requiring EB-5 investors to bet both a significant investment of capital and their and their family’s residency status on whether their investment will result in a significant amount of verified job creation in a narrow window of time. This risk is enormous compared to any other program in the world. It is critical for U.S. policymakers to keep these competitive realities in mind as they increase – intentionally or unintentionally – the cost, time and risk associated with each EB-5 investment. On Capitol Hill, there is a widely held misperception that EB-5 investors are mostly ultra-rich Chinese who smoke cigars wrapped with $100 bills. This stereotype could not be further from the truth. Civitas serves more than 1,000 individual EB-5 clients, over 70% of whom are Chinese. Well Trend has over 20 years of experience serving Chinese EB-5 clients, including helping them document the source of their investment capital. Because the documentation supporting each client’s EB-5 application is so exhaustive (often running to 1,000 pages or more), we gain considerable insight into clients’ finances. In our experience, the net worth profile of EB-5 investors resembles, as is so often the case, a bell curve. At one end of the curve is the small minority of truly wealthy EB-5 investors. For example, Civitas serves one client who, about a year after his EB-5 investment facilitated his move to Dallas, subsequently brought more than $200 million from overseas and invested it in various businesses – a giant foreign direct investment that cost U.S. taxpayers exactly nothing. At the other end of the spectrum are investors who struggle to find the money to participate in the program, who often pool the savings of a group of relatives. And in the middle, of course, are the majority: the 80% or so who are entrepreneurs and professionals that have saved enough to afford a life-transforming $500,000 investment for themselves or, more often, their son or daughter. The fact is that for the vast majority of EB-5 investors, an increase in the minimum investment of $100,000 (for projects in TEA locations) or $200,000 (for everywhere else) is a very material amount of money. America now has several years of positive experience with how powerful an economic development tool EB-5 can be. With scores of U.S. companies depending on billions of dollars of EB-5 capital, Congress should avoid a sudden, shocking increase in the minimum investment amount that could disrupt what has become an important capital market. The lesson of the U.K. experience with doubling their program’s investment amount – an 86% drop in demand in fifteen months – cannot be ignored. With EB-5 attracting billions of dollars in FDI, bad actors have inevitably surfaced. Nothing has done more to sap confidence in the program. Regulators are cracking down hard on wrongdoers, sending an important signal that fraud and abuse will not be tolerated. For their part, the Senate Judiciary Committee held hearings in February and April. Congress appears poised to implement tough reforms aimed at addressing weaknesses in the EB-5 regulatory regime and punishing bad actors. We strongly support these efforts, and have no doubt that a host of needed reforms are imminent. But Congress should not lose sight of the bigger picture: EB-5 policy already gets a lot of things right. It has resulted in job-creating EB-5 investments that have catalyzed economic growth throughout the United States, all at no cost to the taxpayer. It would be a shame for Congress to spend so much time and energy on integrity measures to protect investors, only to gut the program’s effectiveness by pricing a huge number of potential investors out of the market or failing to deal with the visa backlog. In this other words, striking a thoughtful balance is key. This means enacting robust new integrity measures while avoiding crippling over-regulation. And with respect to minimum investment requirements, it means a 40% increase – as opposed to 100% or more, as some have suggested – with automatic adjustments for inflation. This measured approach will both address valid concerns among stakeholders and avoid a counterproductive shock to the market. Global investors have more options for investment-based immigration every day. Those options are more attractive, and EB-5 less so, to the extent Congress increases the cost, time and risk associated with an EB-5 investment. Congress has an opportunity to make EB-5 an even more powerful engine of American job creation. Let’s make the most of it. Larry Wang has served as President of Well Trend United, a licensed migration agency with 11 offices throughout China, for 21 years. Dan Healy is Chief Executive Officer of Civitas Capital Group, a Texas-based investment adviser responsible for more than $500 million of EB-5 capital invested in projects throughout the United States. Both firms are members of Invest in the USA (IIUSA), the nonprofit trade association representing the EB-5 regional center industry, where Mr. Healy serves as a director. The views expressed are those of Mr. Wang and Mr. Healy only. Sources for all figures available upon request.